It always seems like boarding a plane could be a much more efficient process. Normally it takes too much time, even when airliners are always trying to make it better by doing the back to front board. Or are they? Of course, business class boards first. And then, the most common, seemingly optimized, way of boarding used by most airliners is the back to front. That means, all the people who’re allotted the last third of the seating are asked to board. Next the middle third goes in and then the front seating guests. It’s as if there’s no way boarding process could take lesser time. After all experienced airliners must be spending so much to find the best way to save time (money) here. 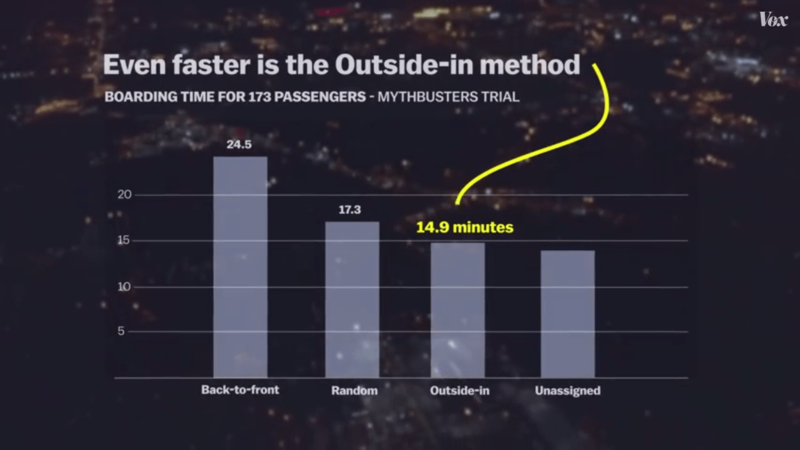 Turns out, this method which most airliners choose to adopt is the worst, and takes more time than possibly any other boarding process. Even guests boarding in a random order would take a significantly lesser amount of time. So why don’t airliners try to do better here? Probably because if they did, no one would buy their express boarding upgrade for an extra $20 to $30. Making the boarding process seem long actually makes them money, not lose. The WILMA technique. Which means window seats board first, next middle seats and then the aisle seats. It’s logical that this would be quicker and is actually much quicker. That is because the people seated in aisle seats don’t have to get up and go to the aisle to let the window seat people go in – like it happens in the above technique. To find out what works better. And which one is the most effective method, watch the simulation below.